Dr. Joan Girona of the Institute of Agroalimentary Research and Technology in Catalonia, Spain, studies irrigation and the water and nutrient needs of fruit trees. In a recent study, he wanted to measure the absorption of photosynthetically active radiation (PAR) for use in analyzing growth and fruit production issues. Transpiration from fruit trees and overall evapotranspiration in orchards is closely related to absorption of solar radiation by the tree canopy, so this study would help researchers more accurately measure these processes. The more measurements he could make, the truer Dr. Girona’s results would be, so he tried a few methods to accurately capture the needed data. First he set up a network of 32 sensors at various points on the ground around the fruit trees to measure light as it came from many angles. Dr. Girona and his fellow researchers found that the values were too distant from each other for good modeling of sun movement. To get enough measurements in a net of this sort, they would need more than 1200 sensors, along with the associated dataloggers and multiplexers—impossible with the resources available. As they thought about how to get measurements from so many points, they came up with a way to move the sensors around the measurement area precisely and quickly. 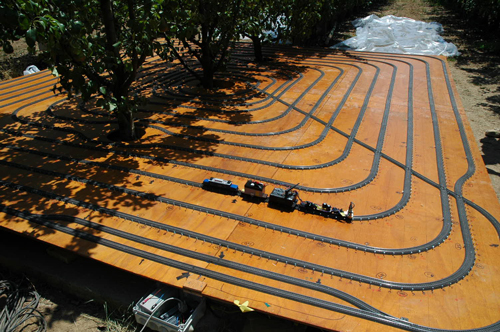 They mounted the instruments—Apogee pyranometers and Campbell Scientific dataloggers—on small-scale model trains and ran the system on carefully laid-out tracks covering a large area around trees in an orchard. They placed metal markers every couple of inches along the track, and electromagnetic detectors on the train sensed these markers and signaled the datalogger to take a measurement at each point. Dr. Girona tried both Campbell Scientific’s CR800 and CR216, but settled on the CR800 because of the higher reading frequency he needed. The thousands of measurements taken each run are downloaded to a computer and provide a bounty of data for the researchers. This innovative solution to a measurement need proved so productive that the scientists are building a new system with a few improvements, and plan to run it on many different orchards in the future.